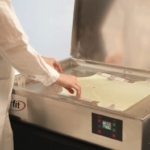 View all Orfit high precision immobilization products here. The Orfit High Precision Patient Immobilization Systems are an active component in achieving a high quality radiation therapy. Thermoplastics with superior moulding properties that result in a high but comfortable degree of patient immobilization. Very stable mask preventing chin-drop and shoulder rotation. Memory effect which allows the user to remould a finished mask as needed. This provides significant ﬂexibility for modification during a patient treatment or simply to save on waste. Thinner masks resulting in less absorption and increased skin sparing. Positioning blocks and wedges that effectively support different neck shapes and allow for ﬂexion and extension positioning of the head. Quick release system allows for fast and safe removal of the mask from the patient. Antibacterial non-stick coating that helps in reducing the spread of harmful microbes in a hospital environment. The High Precision Patient Immobilization Systems are a unique combination of high precision masks, high precision head supports, blocks & wedges, high precision hardware and high precision accessories.